OK, Dave, you’ve convinced me; its GMRS and a Boafeng UV-5R for me (although buying a Chinese product really grates on me). Just of of curiosity, though, is there such a thing as a GMRS base station? I hear you about Chinese products. It is a funny old world, isn’t it – who’d have thought, twenty years ago, that all the best electronics would be coming from China and South Korea; lesserly Japan and Taiwan, and almost none from Europe or here in the US. I regularly visit the annual CES shows and have been doing so for 25 years now; and it is tragic to see how the show has evolved from being dominated by US companies to now being almost devoid of US companies. An amazing shift, right under our noses. But I’m talking off topic. To answer your question about GMRS base stations, the short answer is ‘I don’t know’. The slightly longer answer (which I know you want, right? 🙂 ) is that while I’ve not been able to find any true GMRS base stations (there are products being sold as ‘base stations’ but they don’t have the power or features you are probably wanting); it seems that some ham radio base stations or mobile stations might also have FCC Part 95 approval, making them officially permitted for GMRS use. Due to the limits on GMRS base station power and antenna height, a mobile unit (but mounted in a fixed location at your residence/retreat) would provide all the power you need, and also has the benefit of working from 12V DC as well as from mains power, giving you a more flexible ‘off grid’ solution, should it become needed in the future. Look for ham radios that have the 70cm band, and check not just their receive frequencies but also their transmit frequencies (which are likely to be more restrictive). If the transmit frequencies extend to the GMRS band, then look up their FCC approval number (or ask the manufacturer) to see if the unit has Part 95 approval as well as Part 97. Lastly, do I need to repeat the mantra – get a Ham license and then start using ‘real’ ham gear, fully legally. 1) ALL the dry cell packs are third-party after-market items and NONE of them fit as well as we all would like. They ALL fit too tightly. There are some instructions floating around on modifying the dry cell packs for a better fit, but DON’T DO THAT. They fit TIGHT, and they are therefore hard to put on and latch into place, but they do fit. If you try to modify the pack for a “better” fit, there is a good chance you will mess it up. The trick is to know how to put the batter pack onto the radio, to not be afraid to push it really hard, and to put it on and off several times (the fit does get a little better and you will get used to how much pressure is needed). 2) Both kinds of battery packs take 6 dry cell batteries. Six NiCd or other rechargeable batteries will work just fine – but that largely defeats the purpose of having a dry cell pack. Six common alkaline batteries will provide a little more voltage than the radio is meant to use. With 6 alkaline batteries, the radio will receive, but it will not transmit (there is a protection circuit that shuts down transmit to prevent burning out the radio). With the AAA battery holder using 6 AAA alkaline batteries, the radio MAY transmit ok – especially if the batteries are not very fresh. The internal resistance of the AAA battery is enough to limit the current so that the protection circuit doesn’t shut down transmit. With the AA battery holder filled with 6 AA alkaline cells, the radio absolutely will not transmit unless the batteries are nearly dead. If you want to use the dry cell battery packs with common alkaline batteries, your best solution is to load FIVE batteries and one dummy shunt. The dummy shunt can be a commercially available product that looks like a battery but consists of nothing but a straight wire connecting the two ends. It is easy to build your own dummy shunt by cutting a small bolt or metal rod the same length as the AA or AAA size battery then wrapping the side of the rod with a few turns of tape to make it about the same thickness as the battery. Assemble the pack with 5 live alkaline batteries and 1 dummy shunt and the radio will work perfectly. The AAA dry cell holder pack is the same size as the regular 1800 mAh battery; the AA holder is the same size as the 3800 mAh extended battery. Many many thanks for this wonderfully complete commentary and very helpful addition to the article as a whole. It is truly appreciated. 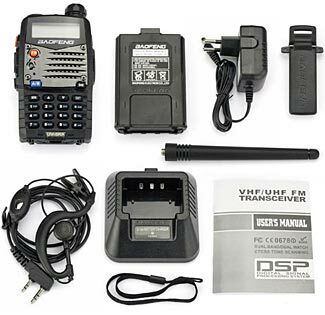 Wow, I sure wish I would have stumbled upon this article before I purchased 4 of the Midland GXT1050VP4 FRS/GMRS Radios and the corresponding base radio for the family. We use them at the beach and on walks, etc. for which they are fine however these are much better. I could have even skipped my Yeasu FT-60 and used one of these radios in lieu of that as well and then we’d all be on the same page. My FT-60 won’t transmit on the GMRS frequencies, just monitor so this is really nice, especially for this price (the same as I paid for the Midlands)! I ordered a couple to try out and hopefully get the family using them now on the GMRS frequencies (I have a license for that). Hopefully that will be the inspiration for them to go and get their HAM licenses finally so that they can then use all of this radio’s functionality and the local repeaters. I’ve been trying to convince them to take the test for a couple years with the promise of getting them an HT but they’ve been so busy with school and sports that it just hasn’t happened. This just might finally do the trick…so thanks for sharing this great info!!! Just curious, have you by chance tested the range of this radio on the GMRS frequencies with the standard antenna and with the upgraded 701 or 771 antennas on high power? My parents are interested in getting a set to talk to me during power outages, etc. like just happened where I live a couple of weeks ago. Cell phones were also out due to circuit overload so they couldn’t get a hold of me and were very nervous. They live a little over a mile from me so I’m hoping these have the range. They are quite frugal so a HAM radio is out (too expensive) but they are very willing to get these since the price is right if they have the range. They also don’t want to take the HAM license test but are willing to pay for the GMRS license…so, hopefully these will work. Any range info you have would be greatly appreciated!!! Thanks for your questions, which are certainly worthy of being carefully answered. 1. Yes, we report on both 701 and 771 antennas in the article. I can’t think of anything else to add that isn’t already said in this article and the two other articles linked in the section on antennas. 2. Depending on terrain, these will probably work over a one mile range. If they are to work as base station type units, then I’d get one of Ed Fong’s antennas instead, either the permanent mountable one or the temporary mounting one. They will definitely help you punch out further. I’d like to be more specific, but I can’t. It all depends, enormously, on the terrain between your two locations. Also you’ll sometimes get better coverage on the UHF (ie GMRS type) and sometimes on the VHF (ie MURS type) frequencies. Assuming you’re the same guy who posted a comment a week or so back, you can get a general feeling for easy/hard/impossible ranges with your present GMRS units. Don’t expect a huge difference with the Baofeng units – a good antenna might double the range, maybe a bit more. 3. I think you’re very confused when you talk about the extra cost of Ham radios. These Baofeng units are Ham radios. They are NOT approved for regular GMRS service. David, sorry that my e-mail came out so confusing. I understand that the radio is not approved for GMRS use however they’re willing to risk it as it will be transmitting within allowable power limits so the chance of discover is probably next to nil and will only be used for emergencies. As to the frugality issue, the UV-5R is much cheaper even with all of the accessories (40% less) than my Yeasu FT-60 all by itself. I understand that the HAM license is $70 less and good for 5 years longer however they are unwilling to spend the time studying and then traveling the 45 minutes to the nearest city which offers the test every quarter like I did since they are in their 70s and don’t like to travel so the GMRS license makes the most sense for them in their current situation. Hopefully down the road they will eliminate that license requirement altogether as has been discussed. As to the increased antenna range, I was just looking for some sort of numbers to qualify your statement above of “replacing the antenna can more than double the range of your unit” to see if this radio would work for them or not. If you would have said something like initial tests gave you 1/4 mile with the rubber duck and 1/2 mile with the 701 then this obviously wouldn’t work for them due to their 1 mile distance so I was just looking for some sort of quantifiable numbers. Since they live in a condo mounting an exterior base antenna is a no-go. I guess I could put a stealth antenna in their attic but again being old that’s probably more than they are willing to deal with. Anyway, thanks for the great site and all the great content! P.S. What are “Ed Fong’s antennas?” Can you post a link? Sorry, Redleg, but if anyone here had tested the operation of the radio on a frequency where its use is illegal, I doubt they would be inclined to publish that fact. That much being said, I see no reason to doubt that the radio’s performance on a GMRS frequency would be any different from its performance on an adjacent Part 90 frequency, or even on a UHF amateur frequency. I won’t attempt to offer any specific range information because the radio itself is generally just about the least important factor in the range of a UHF radio. A mile might be typical for a pair of these radios, operating simplex, over reasonably flat open terrain — less is likely in urban terrain — more is easily achievable over water or from hilltop to hilltop. As with any HT, simply moving one step in any direction may very well double or halve the range of the radio. If you know where you expect to need communications, it is easy to determine what you need to do to achieve reliable communications under the specific conditions involved — but the conditions at one location will not be the same as the conditions elsewhere, and neither will be the solutions. Understood, thanks! Once they get them, I’ll let everyone know if they cover the mile and what the conditions were like so hopefully others can benefit from my experiences with these. Anyone have any recommendations on a simple and reasonably priced antenna to put in my parents attic that could be used with this particular radio to both transmit on the GMRS band and to receive the public safety frequencies? Also what feed line is recommended for use with this radio and on these frequencies. I still am not sure which ones to use (and are optimal) for which frequencies (RG-8 vs. RG-58 vs. Rg-174, etc.). Thanks for your patience! I have only had my Technician license for a year so I know just enough to be dangerous and look stupid. As has been stated, programming this radio to work on GMRS is a grevious violation of FCC Part 95 because it is not type accepted, it has an external antenna jack, and the NA-771 only has a 66% efficiency on UHF. For a attic antenna for this rig, I’m particularly fond of the N9TAX Dual Band Slim Jim — which is available either cut for the ham 2M&70cm bands _or_ for MURS & GMRS. Either will work fine as a receiving antenna for public safety frequencies, although the MURS/GMRS version is actually a better match. See http://www.n9tax.com and pick the link for Slim Jim antennas. His other pages are also worth reading. The N9TAX Slim Jim is built from 450 ohm twin lead (think old style 300 ohm TV twin lead but about twice as big). It is most often used as a portable emergency antenna because the flexible antenna can be rolled up for easy transport (the antenna is about 4′ long) then unrolled and hung from a tree or other non-metal support for use. The N9TAX Slim Jim is similar to the more common J-Pole antenna but provides better dual band performance. There are many suppliers of J-pole and Slim Jim antennas – N9TAX is one of the best, and the only one I know of who builds a MURS/GMRS tuned version as a regular listed product (a few others will make one up on special order). The antenna works well indoors – preferably hung so it hangs well clear of walls, especially walls with wiring in them – it is well suited to installation in an attic. It is a little more complicated to install above the roof because it should not be inside or against either metal or PVC pipe. (This is actually true of all antennas, but especially J-pole and Slim Jim designs). Thanks for the link to N9TAX. I ordered one of his slim Jim antennas to give it a try. Will do. I haven’t gotten any feedback from N9TAX besides an order acknowledgement so I’m not sure what’s going on with that but it would definitely be interesting to compare them both. So then I can not use the HAM radios for GMRS if so equipped? That’s a bummer. I was ready to get a 5R too. Dang…glad I didn’t. I can get a new one for $30 with free shipping. Is the power too much it causes to someone? I would think the extra power would be awesome and extend the range. Not sure why that would be a bad thing??? Is it just a rule from the govt? You are correct, unless a radio has been formally certified by the FCC as being permitted to be used on GMRS frequencies, it can not be used on them. There are various reasons why this is so, relating to various technical differences between different radios and their types of transmitting and receiving, and, as you say, the power output too. As for power, extra power seldom extends the range (see our discussion on power and range in other parts of our radio articles) but it definitely can interfere with other local users. So power is not often a good thing, and often a bad thing. On balance, having the FCC coordinate the use of the radio frequency spectrum is probably a good thing. Without some sort of coordination, and, yes, without some sort of control as well, there could be utter chaos. Think of the FCC a bit like road signs and lanes and speed limits – if, like me, you’ve driven in some foreign countries without any of these things, you know that the driving there can be beyond dysfunctional, whereas the road rules etc in the US generally result in smoother better and safer traffic flow. My goodness me! Am I now writing in support of government regulation? 🙂 I guess sometimes it can be a good thing. Thanks for this article. It’s as complete an article as I could have hoped for. There’s so little well done compilations for information on hand held radios out there, but this just answered almost every question I have. You should own a waterproof radio, unless your “Prep” is fair weather only. You really shouldn’t advise people to break the law. This radio is not type accepted under Part 95 for GMRS Operation – operation of an unapproved transmitter/approved equipment by unlicensed personnel carries a fine of between $10,000 and $30,000 per day, per violation. I fixed and built radios in the Marine Corp and even got a degree in EE. So the FCC is only regulating for their purpose and there is NO reason to ban them from their use. Its their way of control. That’s why I left the Marines and also that’s why there will be a reason to use them in “prepping”. My Friend builds the FEMA camps. He does the welding on the gates. Wonder who will be there and my other Friend works at NSA and told me all about them, and my other friend works in the Pentagon for some General. So I know all this FCC and Govt is full of crap now!!!! Opss……bad word. Oh so I can use them if I get a HAM license then?? How funny…more money…more control…BTW…I do have a license. In your last quote, so then cannot use it for GMRS if you have a GMRS license? But only use it on HAM if you have a license?? ?